Where can I order a granny toy? You sure made use of your marbles. My grand son said he likes the card board marble coarse most. It was creative to invent that. He wants to make one for Whopers, Gob Stoppers, Sixlets, gum balls, and any round candy he can find for his birth day party. Kids come up with the darnest things! 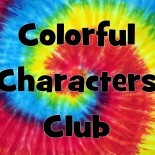 This entry was posted on February 11, 2014 by colorfulcharactersclub and tagged family, friends, fun, games, kid, kids, marbles, teen, teens, toys, Tween, tweens.